This city girl is moving to the country. We've talked about it on and off the past few years and finally decided to just do it. It's going to be quite a change from having a Target and every restaurant imaginable that is close enough to walk to, four Michaels stores within 10 minutes, living near the beach, and leaving the city I grew up in. Instead it will be a mountain view, acres of land and a wood burning stove. American Crafts Guest Designer - Part Two! I'm back to share the last four projects I made for my Guest Designer spot at American Crafts! In case you missed the first four projects I shared, you can see them here. Y'all know how much I love old family photos, and this is definitely a treasure! It's my great-great uncle and his friend building canoes back in the early 1900's. The globe photo overlay from Shimelle's new collection works great as an accent behind the photo, and I especially like Amy Tangerine's After Glow Thicker letters. Love that font! My girl always wants to take a picture with the display at Old Navy. Of course I gladly say yes! I mixed and matched from all the new collections for this layout. I "borrowed" my daughters watercolor paint set to add just a bit of pink to Dear Lizzy's wood veneer gem, then used Shimelle's gold Thicker letters to spell the word gem. A "Project Life" style layout with three 3x4 cards along with a photo. Dear Lizzy's wood veneer donut and title were mixed in with her cute Thicker letters. As always, thanks for stopping by and a special thanks to American Crafts!! It's been almost a whole month since I last posted here on the blog. It's been a busy but exciting month, and I'll have some fun things to share coming very soon! For now, let me jump right back in with a layout. 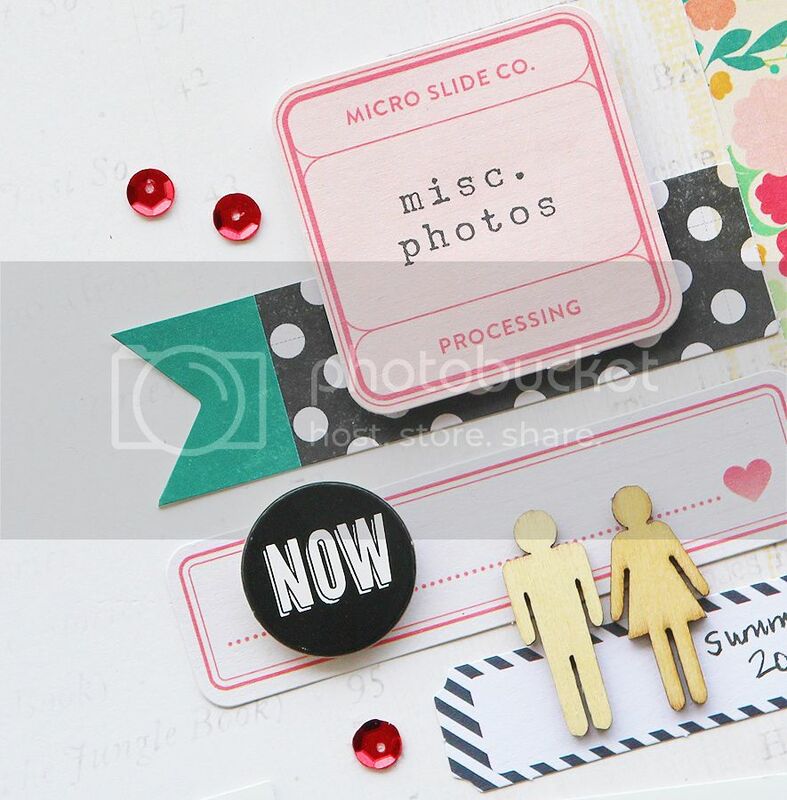 I used a mix of papers and embellishments on this one, and even added the Mr. Pickles sticker that I nicely asked for at the cute little sandwich shop where we took the pictures ;) It made a perfect custom embellishment!